Nissan Leaf deliveries start in UK | What Car? UK deliveries of the all-electric Nissan Leaf have begun. Richard Todd, a silicon chip designer from St Albans, was the first customer to place an order for the Leaf and was the first to collect the electric car picking up his Leaf from Glyn Hopkin Nissan in Waltham Abbey today. Mr Todd specced his Leaf in Kuro black with optional roof spoiler with solar cells. He hopes his new car will be ideal for family life. 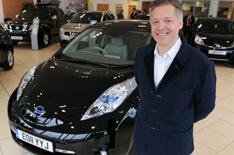 Also collecting a new Leaf was Smooth Radio DJ Mark Goodier. 'It's everything that people such as me who have been driving electric vehicles for a long time have been waiting for,' said Goodier. Nissan says it has more than 500 pre-orders for the car. Further deliveries are planned for Friday, with 10 more expected next week. Nissan recently increased the price of the Leaf by 2000 blaming the high exchange rate of the yen. The car now costs 30,990 before the UK's 5000 Government grant.